of the REIT on an annualized basis. 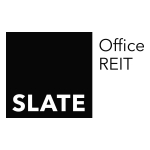 record as of the close of business on April 30, 2019.
information can be found by visiting slateofficereit.com. About Slate Asset Management L.P.
and execute on a wide range of compelling investment opportunities.